The main pages of the site can be viewed in the native tongue of Norwegian, or in English. A search menu is provided to allow the selection of the county, parish, type of record, time period you wish to search. Records that are available for searching are baptism and confirmations, marriage, death and burials, migration, vaccination and diary records to name a few. The types of records available will vary according to what has been preserved. The images that I viewed are clean and crisp, but I am not sure of the condition of all of the records. You will need to have some knowledge of basic Norwegian terms that would be used in parish records. These can be found at FamilySearch.org. If you click here for the word list is in the standard HTML format. If you have Adobe Reader, and prefer to view the word list in a PDF format click here and you will be redirected to the FamilySearch website where you have the option to download this list and save it to your computer for future reference. The link for the PDF file can be found under Norway - Norwegian Genealogical Word List. 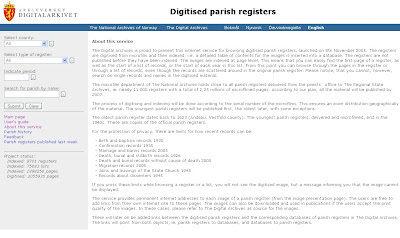 If you would like to research in the Norwegian Parish Registers, please click here to be directed to the English version of this site.